filmmaker and all-around creative whirlpool Jan Baross takes us into the daily life of Cubans. These excerpts from her book will take you with her. When Jan Baross went to Cuba on a literary tour to meet with Cuban writers, she went with a notebook. And a sketchbook. I think she never travels anywhere without both of these indispensable tools. If you’ve seen any of her earlier books, which you can check out here, you’d have known she was going to write about this trip. And draw it. And completely delight you with it. The result is Ms. Baross Goes to Cuba. The struggles, the joys, the color and music and dancing, these are the experiences Baross uses to paint her word pictures. Then she adds her delightful sketches made along the way. 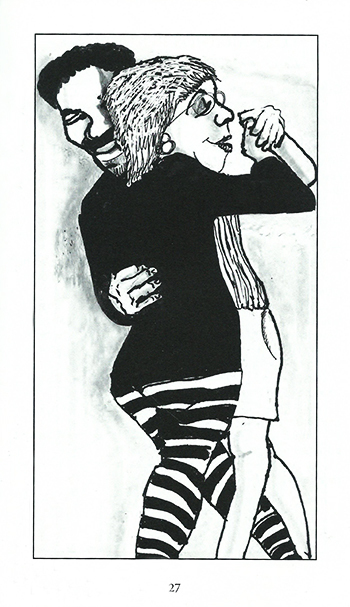 In these short word-and-picture sketches, she takes you behind the scenes of what she saw, heard, tasted, and danced. Have a brief look inside the book. I think these excerpts will make you want to see more! They described Cuba as a lush island of spectacular beauty, endless music, and wide open fun. My youthful imagination took it from there. Then, in 1959, I read about Castro’s revolution. Later, after living through the Cuban missile crisis, I was left with the conflicting impressions of beauty and annihilation. Now, fifty-eight years later, I was going with a troupe of writers to clarify Cuba for myself. I join our group on the hotel’s humid veranda where they’re scarfing down free introductory mojitos. I take a sip and nearly choke when an elderly Cuban woman shrieks and clasps her hand to her heart. She stares into a cellphone and shouts. The old woman bursts into tears and then delighted laughter. The early evening air is soft and warm as I amble past my neighbors. Their “good evening” doesn’t sound like the Mexican Spanish that I am used to hearing. “Buenas tardes,” becomes “Buen tar,” as though someone is holding onto their tongues. It has a softening effect on their words. The band plays a captivating rhythm. Everyone moves, rocks and sways. A man with coffee-colored skin and green eyes is sitting at the next table surrounded by three black women with huge smiles. He lunges over and asks me to dance. He takes me in his arms and begins to move. The beat is so deeply rooted in his body that it awakens the same rhythm in me. Our legs move weightlessly like soft light between shuddering ferns. If this is dancing, I haven’t lived. Our second evening in Havana. The evening air is so hot that my fellow writers and I decide to take a stroll in search of an elusive Havana breeze. As we cross the street, a man with a big smile introduces himself as Alex and waves us into his mansion. Naturally we follow the adventure through a small tree-lined garden. Upstairs is a wonderful restaurant with a colorful bar, a cozy sitting room and a long banquette. This was his family’s mansion that had to be abandoned during the revolution. Two years ago, Alex returned from the U.S. to open his Los Naranjos Restaurant. The major problem was how to advertise in Cuba. Just as Alex thought he would be forced to close his business, an American tourist wandered in to dine. The American was so impressed that he posted a rave review on the web. Ever since then, the restaurant has become a dining destination in Havana. Alex serves us lobster and an amazing salad that has to be one of the high points of my culinary world. With such open-hearted people, it’s not hard to get adopted in Cuba. As we leave, we remind each other to post rave reviews. My protector wears a torn, short-sleeve yellow shirt and his eyes are cataract gray. Like most Cubans I meet, he talks loudly and with ferocious passion. He speaks like the best lecturers on the good and evil of his country. When I run for my bus, he surprises me by struggling to his feet and running alongside with his hand out. I give him money, of course, because I now realize the old gentleman’s trade is discourse. His intelligent tirade is the way he supplements his unlivable government pension. My CUCs are his next hot meal. I hop on this bus, watching as he returns to his bench. As a self-taught artist living on Hamel Street, Salvador began painting murals on his neighbors’ walls in the ’90s. He is still adding images to three-story high apartment buildings. Salvador describes his work as surrealism, cubism, and a little art-naive. Tourists fill the tiny coffee shop, a small art gallery and a colorful canopied area where Santeria priests dance to rumba every Sunday to evoke the spirits of Orishas. 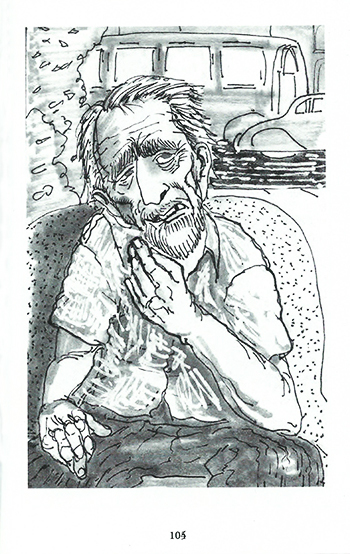 On the way out, I notice a gray-bearded man sitting on a painted bench, with one bare foot in the lap of a young girl. She’s in the process of giving him a pedicure. My transvestite friend tells me the bearded man is the famous artist, Salvador Gonzales Escalona. José Fuster’s installations remind me of Watts Towers in Los Angeles. Fuster is a well-known Cuban artist, painter, sculptor with his most visible contribution being the public art in his home town, the fishing village of Jaimanitas, outside of Havana. In the last ten years, Fuster has decorated over 80 of his neighbors’ homes so that the small town itself has become a unique work of art. It’s reminiscent of Hamel Street in Havana but on a much grander scale. I follow children running through shining archways and past giant tiled figures. All surfaces are covered in bold murals and decorative design. It’s truly amazing. The inclusive Artists’ Wall is composed of tiles by other Cuban artists. Fuster has installed a theater and public swimming pools which he sponsors with the sale of his paintings and ceramics. I hope you enjoyed this small taste of Jan Baross’ views and insights in Cuba. You can purchase your own copy of Ms. Baross Goes to Cuba on Amazon. 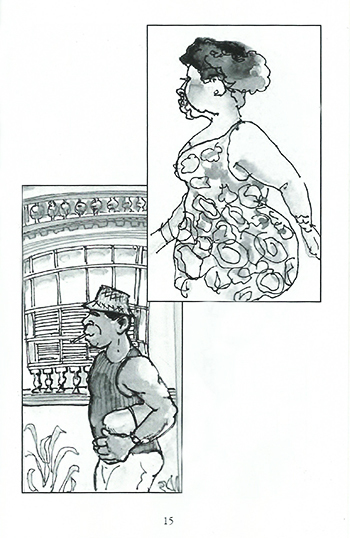 Many of the sketches in this book have also been included in her Cuba coloring book. You can also see the whole range of Baross’ books, including her wonderful magical realism novel, Jose Builds a Woman, also available on Amazon. You know you want to save this! Disclosure: This post includes affiliate links. If you click on one of the links and make a purchase, I will earn a small commission. This helps cover the costs of running the site and it costs you nothing extra at all. And I never recommend anything I don’t use or love myself. I loved this book! Thanks for considering it. Cuba is such a fascinating place and these extracts give some insight into the rich fabric of this country. As I read the restaurant one, I could picture myself sitting on an upper level paladar, eating local Cuban fare which was ridiculously cheap and wonderful to eat. As we sipped mojitos, we looked over the Cuban life playing out below us. A fabulous evening. Sounds like a very interesting book. You paint a beautiful picture of Cuba, also, Kerri. 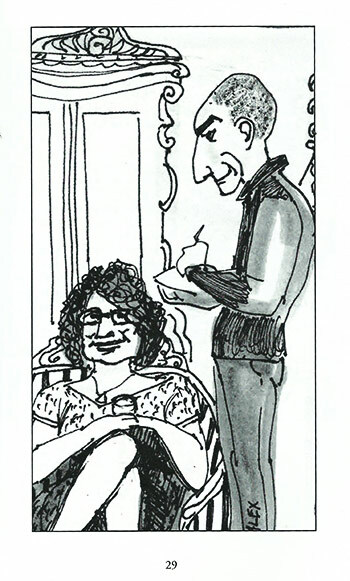 I think you will enjoy reading the other vignettes and looking at the amusing sketches in Jan’s book. Oh what a fascinating book, not at all the kind of thing I might have considered had I not seen your review but now I’m keen to read it! Thanks Kavey. I think you will enjoy it. It is a “different” kind of narrative–small glimpses that add up to a beautiful whole. This looks like a fascinating book. I am reminded of a quote saying life is made up of moments. I like how Jan Baross has used a series of moments to paint a picture of Cuba. I found all the snippets you shared interesting, but connected particularly with the dance piece (I like the rumba) and Strolling with Cubans. I’ve just finished an introductory Spanish course and in one of our classes we talked about some of the differences in how the language is spoken in different countries. The instructor mentioned that Cubans drop a lot of sounds. You’ve hit on the exact reason I loved this book, Donna. These small glimpses of everyday life, the peeks and overheards and insights, add up to a full picture that tells a whole story. I also loved the dance one. It made me jealous! Love the idea of travelling with a sketchbook. The sketches and Cuba are lovely. Thanks for sharing. I agree about the sketchbook, Bola. I’ve done it a couple of times and it helped me see things in a new way, as well as cementing images in my brain. I only wish I had half the drawing talent that Jan has! We have always wanted to visit Cuba before it changes and the cruise ships sail in. I know it’s very selfish, great for us visiting tourists loving the old cars, cigars and bars but not so much fun living there and struggling to make a living. I feel the same. I have long wanted to visit Cuba, before the influx of US tourists changes it irretrievably. Of course, there have been European, Canadian and other tourists visiting Cuba for years. But now, with Fidel gone and more and more tourists pouring in, I think the changes are bound to accelerate. Still, it is clear from Jan’s book that it is not an easy life for most Cubans. Tourism is bound to be a big economic boost for many. Cuba has fascinated me for many year and one day I will get there. The stories in this post are wonderful really brings it to life…. I feel the same, Michele. Long fascinated. And hoping my “one day” is soon, before the flood of US tourists changes the country irretrievably. It looks like Jan Baross had an interesting journey in Cuba. Love the sketches. It’s a place I really want to get to! Me too, Billie. Maybe we need to arrange a “Boomers’ Tour” !! Sounds like a great book! Love the addition of sketches and the additional coloring book offered as well. 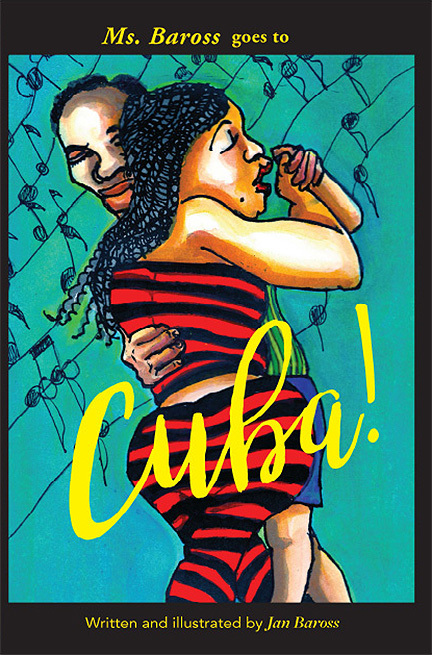 Cuba has always fascinated be and I’d love to visit sometime–thanks for giving us a taste through a sample of the book! You are so welcome, Jenna. Mostly I posted it because I love the book, I haven’t been to Cuba myself yet, and I WANT to go! This looks like a fascinating book – and I love the illustrations. She certainly has a way with words, I can just imagine being there with her from the excerpts. I long to get there before tourism ruins this time capsule of a country! Exactly my thoughts, Vicki. I do believe the influx of US tourists is going to make such a huge difference in the country. Some of the changes will be good, I’m sure, as in more money, more employment and more opportunities for Cubans. But some will be sad indeed. 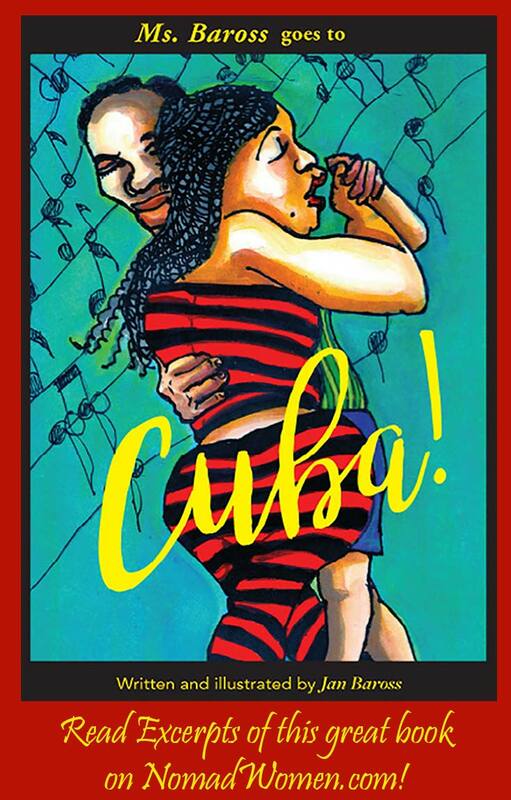 Looks like a creative way to portray Cuba. The illustrations are great. Cuba has an air of mystery around it. It’s in the top three places I really want to visit. I hope I get there soon! Oh, so do I Christina. Great post, Donna. I so love the idea of these glorious, fun sketches and what they represent. I try to do it in words for myself when I travel…but oh how I wish I could draw and capture the essence of daily life like this! Thank you! I so agree, Vicki. I’d love to be able to capture this essence with a drawing pencil. But my words and camera will have to suffice for now. I have always wanted to go to Cuba. I love this book and the idea of sketching things. You really get to see into the life of the people and places! Indeed, Stacey, I also love the idea of sketching. I just wish I was better at it! Jan Baross is a wonderful storyteller. She’s so engaging. Thanks for sharing the excerpts from Ms Baross Goes to Cuba. I’ll have to get a copy of her book. Thanks Debra, I’m glad you enjoyed the short excerpts. 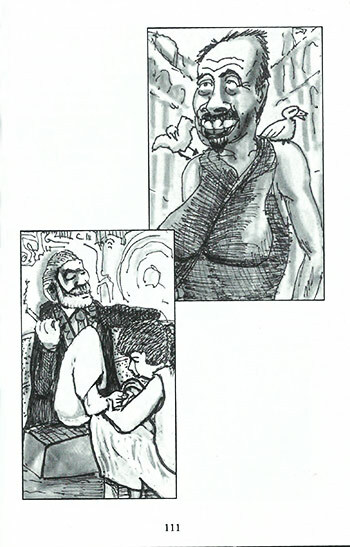 The entire book is a delight… including an illustration for each vignette. What an intriguing book! So many stories here to share of such a unique and fascinating culture. I still haven’t been to Cuba (even though I’m Canadian and could have gone forever now!). I need to go! I keep reading so much about Cuba online, too! I’m glad you enjoyed it, Lauren. Yes, you need to get to Cuba and report back! You do that so well. I hope to get there myself soon. You’ll enjoy it Meg. She has similar books with sketches about Paris and San Miguel de Allende. They are all delightful. What a beautiful account and insight to a trip. I found myself smiling through this with the start of WiFi grandma. I’ve been dying to visit Cuba for sometime now. The temptation to hop on a plane from Central America crossed my mind but my wife and I had a trail we committed to. Soon enough we’ll be able to see much of this on our own when we finally visit. Thanks for these photos and this post! I also fell in love with WiFi Grandma! I’m glad you enjoyed the excerpts. 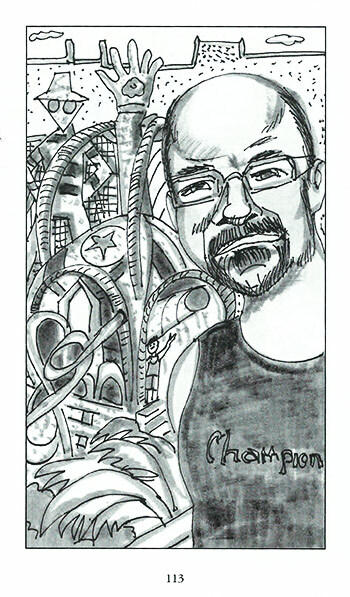 Jan has done similar books with her sketches about Paris and my home town of San Miguel de Alende, in Mexico. She has a special gift. I’d love to visit Cuba, but my boyfriend doesn’t really want to go there. Such an inspirational post. Do try to convince him to go, Anna. Maybe show him the post? Some of you will also enjoy reading my mystery novel, “Rum, Cigars, and Corpses,” available from Amazon either as an e-book or a paperback. 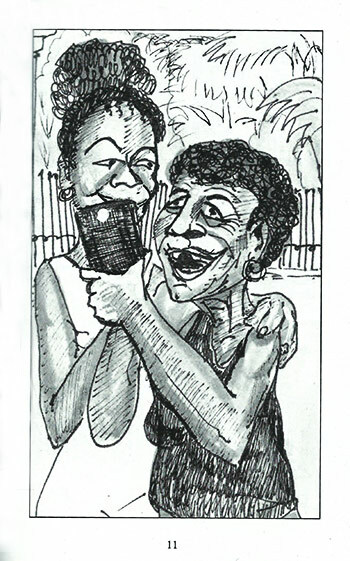 It’s based on a person-to-person tour my wife and I recently took to Cuba and incorporates many of the same experiences (food, music, color, murals, cigars, vintage cars), but especially the people, as seen through the eyes of my fictional tourists. I love the idea of writing fiction based on our travels, Jerold. Good luck with the book. Multnomah Falls—Portland, Oregon’s Nearby Magic Maiden U.S. National Parks Senior Pass Price to Rise Soon–a Lot!